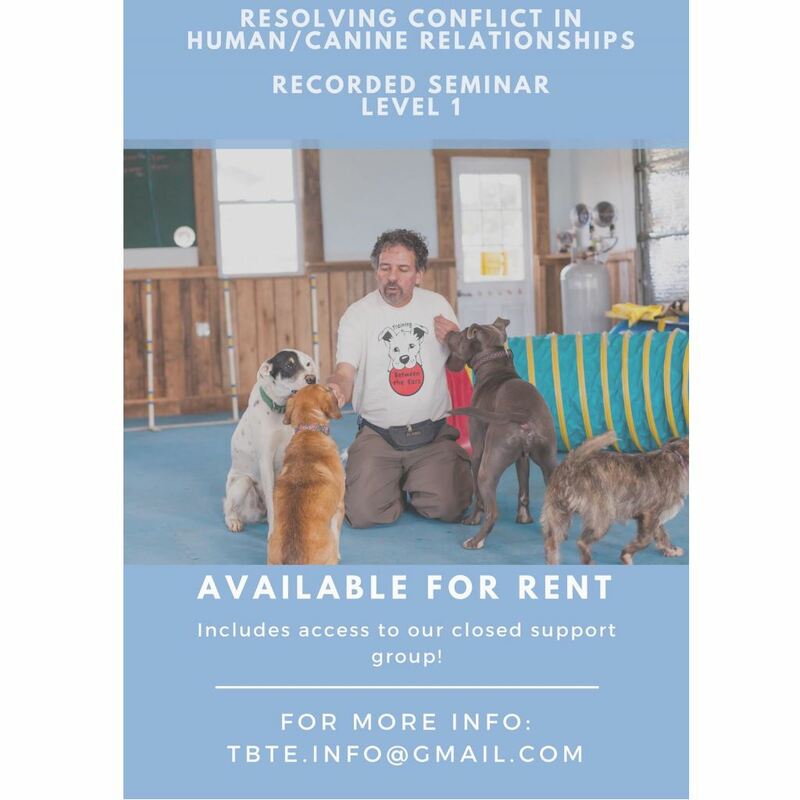 Training Between The Ears (TBTE), is a system primarily for solving behavioral problems which involves a number of techniques that all support Mark McCabe’s primary objective of removing conflict from relationships and training, and to the greatest degree possible not just changing the external behavior of the dog but actually changing the internal states and perspectives of the dog that drive problem behaviors. It is TBTE’s goal to help a dog to be able not just to choose not to do bad things or to follow commands of their owners, but to get them to prefer to behave in ways that are better for their happiness, emotional and physical wellness and success in their world. We teach healing with an ‘a’. Mark has over thirty two years of experience working with dogs which others have written off. Many of the dogs he works with have been through other training programs, been on medication, their owners may have read a virtual library of training books, watched hours of TV dog trainers and yet still not found the keys to resolving their pet’s problems. Often these dogs have come from shelters, rescue groups or otherwise been through multiple homes. Often their owners have been told by trainers, family members or a veterinarian that they need to euthanize their dog because there is no hope for it or that the animal is not safe. With good cooperation and effort from the owners Mark is consistently able to help them turn these situations around and not only have an animal which they can live with but to truly bring joy into the relationship for both the dog and the owner. While almost any training will help improve an average dog for those who have issues with anxiety, fear, hyperactivity, pronounced lack of self-control or aggression (and many have several or all of these issues) many, perhaps most training programs either make only marginal changes or sometimes even seem to make matters worse. Often people with difficult dogs speak of success from the training or medicine they have tried in terms of minor improvement over fairly long periods of time. Mark’s clients consistently write and talk of very substantial improvements made remarkably quickly. In fact, it is common place for clients to comment that their dogs made improvements during the first session with Mark which had proven impossible over months or years and often lots of money spent on other training or medicine. Is your dog’s behavior causing problems for both of you? Have you actually considered giving her up or even the heartbreaking possibility of euthanasia? Have hope, Mark has a very long and consistent record of turning around even the most difficult and seemingly hopeless animals. Your dog’s not that bad? Great, it will be that much easier to help you! 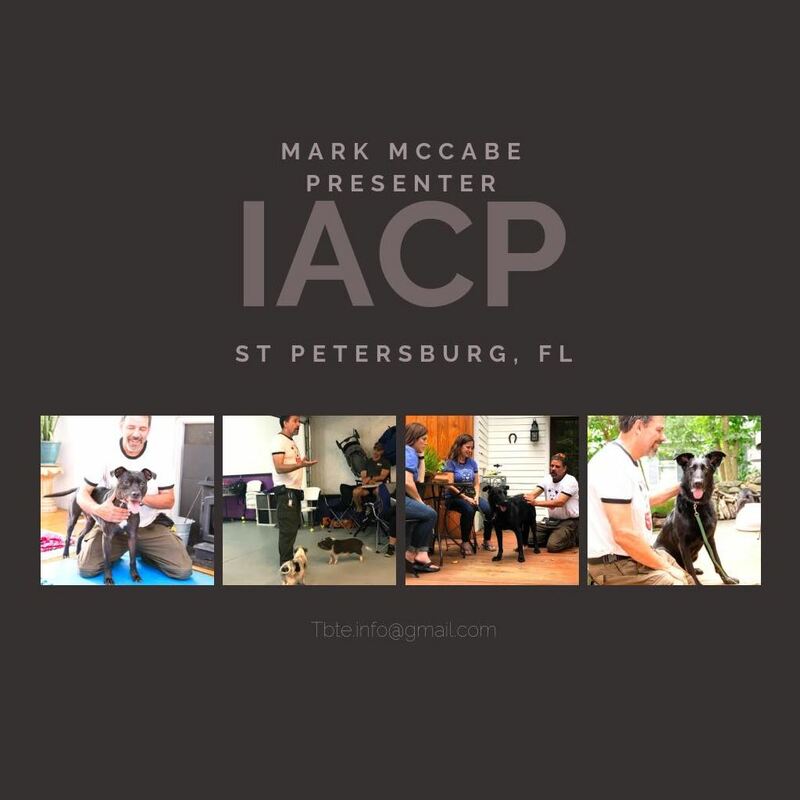 Come on inside and find out more about how Canine Behaviorist Mark McCabe can help you and your dog have the love affair you had in mind when you got him or her…..
Come and find out why trainers have been raving about their experience working with Mark and learning about Training Between the Ears (TBTE). Hear why this system has made their training / business more fun AND more successful for them and their students. Join us to see and learn how this gentle and simple process can transform very difficult dogs and change their relationship with their owners all while being easier for the trainers, students, and dogs. "All I can say is WOW! I've attended 2 of Mark McCabe's workshops over the last 3 months. I can’t wait to go back and learn more from this highly gifted trainer and teacher." “Never did I imagine something as BRILLIANT as TBTE, Training Between the Ears. It's absolutely nothing like anything else out there. Mark teaches dogs how to be an optimist instead of a pessimist. He solves some of the most distressing cases in the most compassionate way with tools any owner can easily use. With regard to educational value, it was the absolute best seminar that I've ever attended." "Mark is fluent in a really varied set of skills. From straight up bite work at a high level, to rehabilitation work. He combines Conditioned Relaxation into protection work! That alone is remarkable. But, he is also open enough to move between modalities when needed. Again, another rare quality. Add the fact that he is patient and a humorous teacher of humans.. And you get a really rare thing." “It’s funny when you spend 10+ years in a profession, and you have a really good handle on things. Then you meet someone who changes your life. Your outlook. Your way of thinking. For the better. Mark McCabe, and his Training Between the Ears (TBTE) methodologies, is that someone. At first it can seem counter-intuitive yet magical at the same time. If that makes sense. But I have become a better trainer, and a better person, because of TBTE. "Our experience learning the TBTE system has helped us enhance our training significantly. We enjoyed it so much that we decided to bring Mark & Stephanie to Utah for a seminar!" Taking a TBTE workshop with Mark McCabe is like a backstage pass to the best magic show ever. You are initially wowed by the performance, taken aback by the amount of research and preparation, and then amazed by the results when you do it yourself. Mark is all about hands-on. Training the trainer. And in my mind, there is no other way. My training schedule, booked for 4 months out, will absolutely testify to that. "Learning the TBTE system has helped us enhance our training significantly"
"Changes your life. Your outlook. Your way of thinking"
"My training schedule, booked for 4 months out, will absolutely testify to that." “Taking a TBTE workshop with Mark McCabe is like a backstage pass to the best magic show ever. You are initially wowed by the performance, taken aback by the amount of research and preparation, and then amazed by the results when you do it yourself. Mark is all about hands-on. Training the trainer. And in my mind, there is no other way. "It's absolutely nothing like anything else out there." “Never did I imagine something as brilliant as TBTE, Training Between the Ears. It’s absolutely nothing like anything else out there. 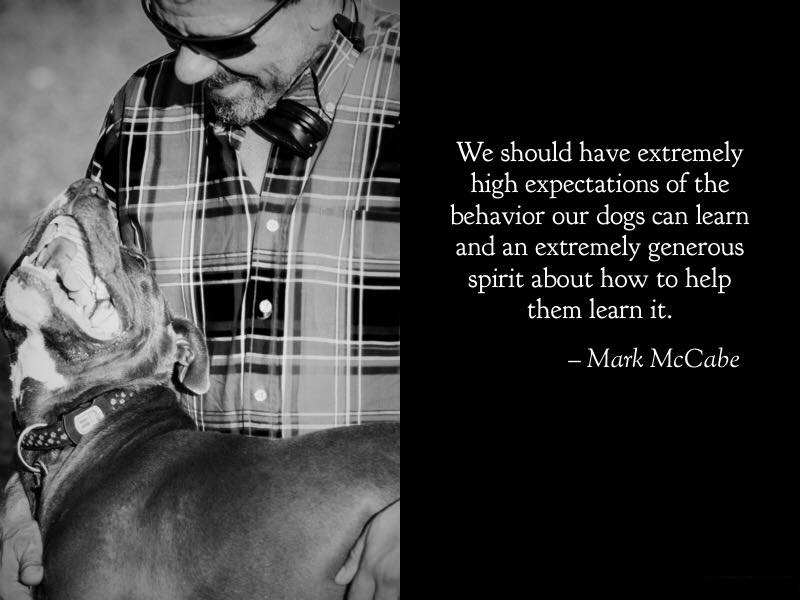 Mark teaches dogs how to be an optimist instead of a pessimist. He solves some of the most distressing cases in the most compassionate way with tools any owner can easily use.